The rolling stock preserved on the North Yorkshire Moors Railway is used to operate trains on the North Yorkshire Moors Railway (NYMR), a heritage railway in North Yorkshire, England. There is a variety of preserved steam and diesel locomotives and diesel multiple units, passenger coaches and goods wagons. Some are owned by the railway itself but most are owned by various individuals or voluntary groups. The line is also regularly visited by locomotives based elsewhere. Some come for a day on a railtour, others for a few days or weeks to take part in a special gala, but a few stay for many months and form part of the stock working scheduled trains. The locomotive can haul trains on Network Rail, only on the 6 miles (9.7 km) of the Esk Valley Line from Grosmont to Whitby. 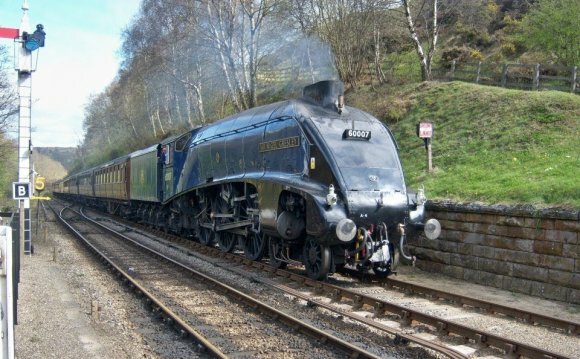 Whitby to Battersby via Grosmont during special events. Some mainline certified locomotives are not permitted to run on the line to Whitby due to various technical reasons, which may include: high axle weight exceeding the bridges maximum load on this route; the route's curves are too tight and may damage the locomotives driving wheels, etc. Certified for full mainline use on the National Network besides the Whitby to Battersby sections. Loco not permitted to operate over the mainline due to flange less centre driving wheels & route curves being too tight which could cause a derailment. 44871 BR lined black, Early Emblem Operational Yes (3) Built 1945 at Crewe Works. Visiting for the winter period from the East Lancashire Railway, operational and mainline certified. BR Lined Black, Early Emblem Await Repairs / Withdrawal Visiting for 2015 season. Currently out of action after crack in firebox discovered, decision not yet known if repair will be undertaken or withdrawn from traffic. 45428 BR lined black, late crest Yes (1) Built 1937. Returned to service in 2010 after a lengthy overhaul. Now back in service after cylinder repairs. 75029 The Green Knight BR lined green, late crest Built 1954. Moved to the NYMR for overhaul by owner, the artist David Shepherd, he agreed to sell her to the trust. Locomotive is Mainline certified between Whitby & Battersby only to cover Esk Valley Line running. Returned to service in 2012 following overhaul. 76079 BR lined black, early crest Built 1957. Recently undergone a mid life boiler overhaul and returned to full service in December 2014. Mainline certified for Esk Valley and Whitby running. Steam Train 7822 at Pickering, North Yorkshire.